Hello reading and writing, friends and colleagues. Thanks to Twitter & Facebook networks, I have a fantastic guest to introduce you to today; Artist & Author, Mr. Shane Evans. Shane W. Evans, (St. Louis, Missouri), has lent artistic his talents to nearly 30 children’s books. His work has brought him recognition from the White House, an invitation to the Nation Book Festival, and has been showcased on The Oprah Winfrey Show and The Late Show with David Letterman. 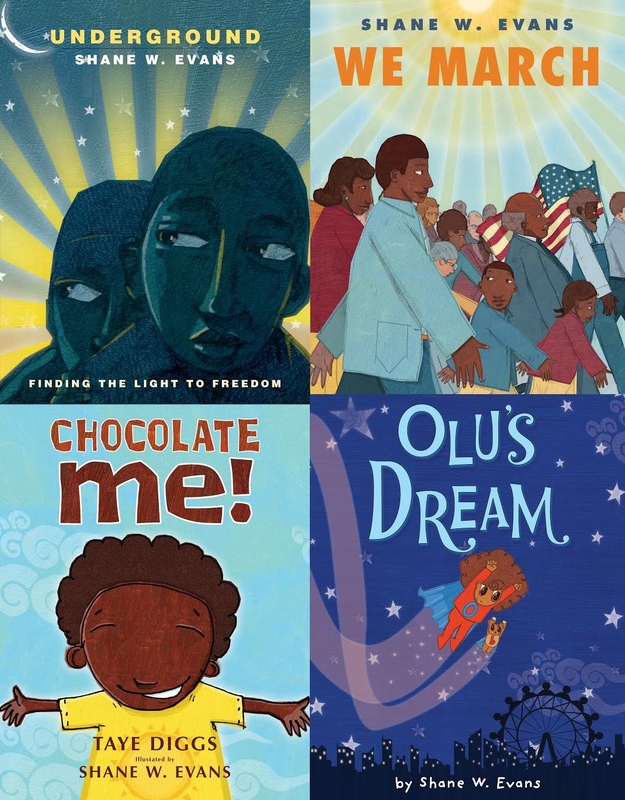 In addition to his awards and achievements, Evans has worked with many celebrities on their books, including, Holly Robinson Pete, Shaquille O’Neal, Taye Diggs, Bell Hooks, Deloris Jordan and Rosilyn Jordan, and has been published by Scholastic Inc., Harper Collins, Candlewick, Chronicle books, with more releases to come. Tell me about your latest illustrations? What are the books about? I have had 4 books come out in the past year. 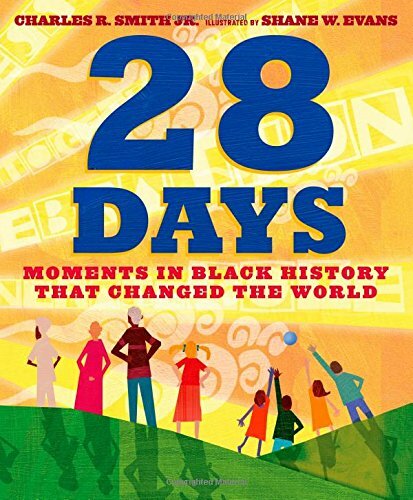 A 28-(9) day journey celebrating the stories of great people in the world and african history that has been spread worldwide. From Nelson Mandela to Obama. It is a colorful and poetically creative voice. 2) “MIXED ME!” With Celebrity Taye Diggs. This is our second book collaboration and is due out in October 2015.. The story of a child with a lot of energy. Very self-confident about knowing who he is. Mixed Mike is what we call him and he knows love from all sides. His mother and father come from 2 different skin tones but LOVE is the focus. The Book Thief meets Hotel Rwanda and Girl Rising in this stunning film adaptation of The New York Times critically acclaimed novel. 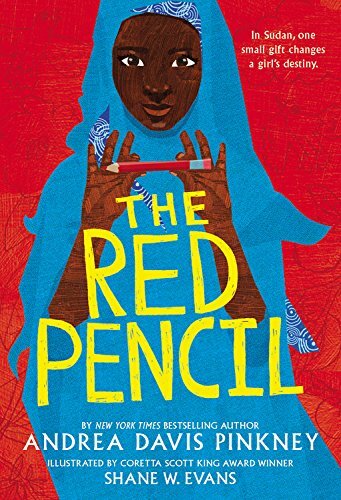 It is the story of twelve-year-old Amira, who lives in a Sudanese farming village. Her one true wish is to attend school, despite the values of her traditional mother who believes girls should spend their days helping with chores or preparing to marry. When Amira’s home is ravaged by attackers, she and her family seek safety in a displacement camp. Her world is shattered ― until a simple, unexpected treasure reveals endless possibilities. Who or what inspired you to work on this series? Regarding CHOCOLATE ME! And MIXED ME! This is a series that came out of the friendship between Taye and I. We went to school in Rochester (SOTA) and went to Syracuse together at SU. 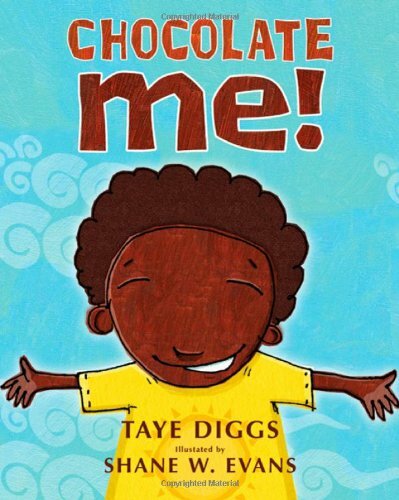 We came up with the idea for “Chocolate Me!” and published the first book years later. This sparked the second book “MIXED ME!” and because of the success of the first and the buzz with the second we are already talking about going to a 3rd book as well as expanding into animation. What was your favorite part of the book to work on? As the illustrator it is always telling the story that is interwoven into the words that you can’t see. There are many more stories in the pictures so I am always looking for ways to tell more of the story in the pictures. Clues and hints all the way through. What do you find most rewarding in this? Getting to connect with children and families. Do you have any other books/illustrations complete or in progress? Yes. I have about 30-35 titles that have the name Shane W. Evans on the cover, some illustrated by me and/or both illustrated and authored. What are your future plans with this project? GROW into a global brand and a movement that brings families together around challenging topics that have to be addressed in a loving way. This is what Chocolate Me!, Mixed Me! & Olu’s Dream are all about. To just be positive even if negative situations arise. Ask your heart for guidance and be KIND and LOVING. Hit us up at the Facebook pages and help us reach out to many. The best links are going to be FACEBOOK and SOCIAL MEDIA. 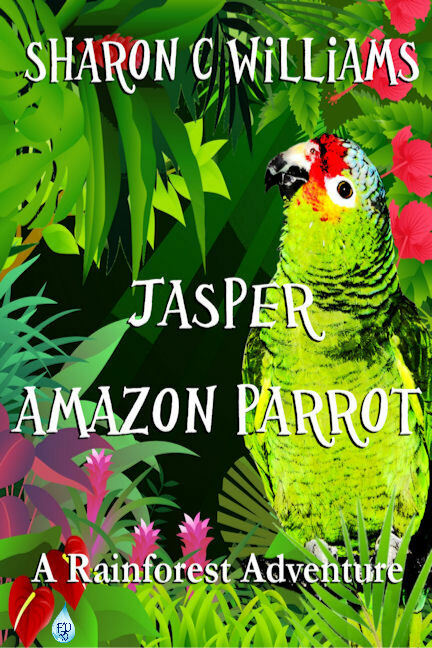 And friends, please feel free to share this post to help spread the word about this amazing artist & author and his books with your family and friends. Thank you so much for stopping by! My guest today is a young Children’s Author/Teacher from Spain. Like so many great artistic minds, I met her though other Indie Author friends online. I also had the pleasure of showcasing her book during the holidays and it is my honor to continue my work in support of Indie Authors as I turn this interview over to her. She is Cinta Garcia de la Rosa. I am Spanish, and I have always been obsessed about writing and reading. I have also loved learning languages, so I decided to study English at university, and so I got my BA in English Studies. Nowadays, I struggle to combine both my day job as an English teacher and my night passion, writing stories. Oh, I think I have been writing all my life, either stories or journals. I just can’t finish a day without having written at least a couple of sentences. When I was 5, I was given The Wizard of Oz. I learnt to read by myself by using that book and Sesame Street. Well, when I managed to read the whole book, I decided I also wanted to write stories like that. And thus I started writing silly tales. I mainly write short stories. I am focusing now on writing children’s stories, but I don’t consider myself a writer of a certain genre. I like experimenting. Little Nani is a little girl who likes helping people. However, when she helps people the results can be a bit unexpected. Why is that? Little Nani is a witch! Or at least she wants to be a witch. With her magic wand, she will try to cast different spells to help her friends, but she won’t be successful all the time. Follow Little Nani in her funny adventures and meet her extraordinary friends. Funny ostriches, horses that love reading, super-fast turtles, grumpy zombies,… Little Nani has lots of friends! You can also draw your own characters! Little Nani is willing to become a good witch. Will she manage to do it? Who knows? Read the stories and discover what happens next! The fact of knowing that somewhere around the world there must be someone smiling while reading my stories. I am writing the second volume in the Little Nani series, as well as some stand-alone stories, all of them featuring Little Nani. These stand-alone stories will be “choose-your-own-adventure” books, and I hope my readers find them funny. My only plan is never give up writing. I would really like to write at least 5 books in the Little Nani series, but that all depends on the readers’ response. Write every day, read every day, talk to both readers and other writers (you can learn a lot by doing that, trust me), write a blog and build your audience, and find a good editor (this is of the utmost importance). Oh, and believe in yourself. If you believe in what you write, you will find the way to be published, and readers will love your work. Only that if they feel like big kids at heart, no matter how old you are, you will enjoy my Little Nani stories. Trust me, I am not saying this just because I am the author. I truly believe that my stories have the power to make people smile, and that’s one of my main purposes in life. Apart from that, I would like to encourage future fans and friends to contact me and talk. I love hearing from readers and fans, I always listen to their suggestions and opinions, and it is a great way for us to grow as better writers. Thanks, Tracy, for inviting me over to your blog and for giving me the opportunity of talking a bit more about myself and my book. It has been great. Thanks! Thank you too, Cinta, for sharing your story. It was a pleasure to showcase you and your work. All my best to you. Uncle Toby had said that there would be castles to explore, with ghosts and things. This helps to cheer up the glum twelve-year old Lovell twins, Tom and Mary, leaving their schools and loving parents to be evacuated to wild Northumbria during World War II. Then the adventure begins. 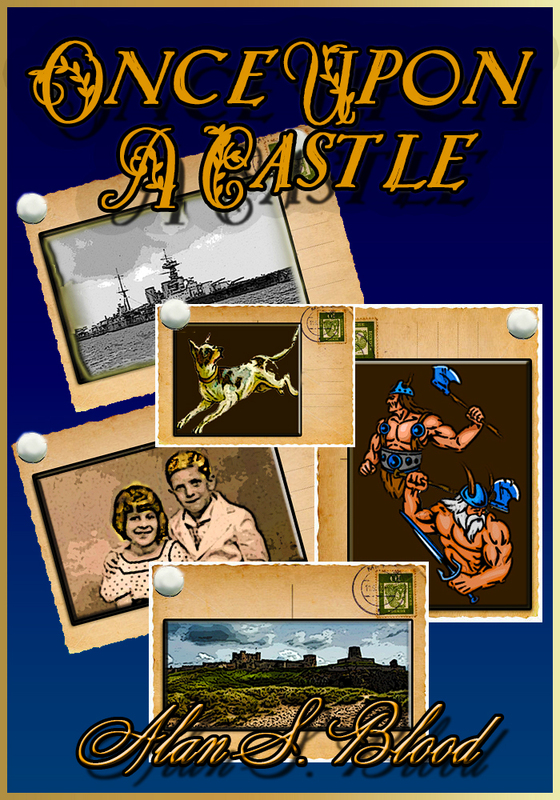 ‘ONCE UPON A CASTLE’ is a ghost story written for young people (but also enjoyed by adults) set in World War 11. 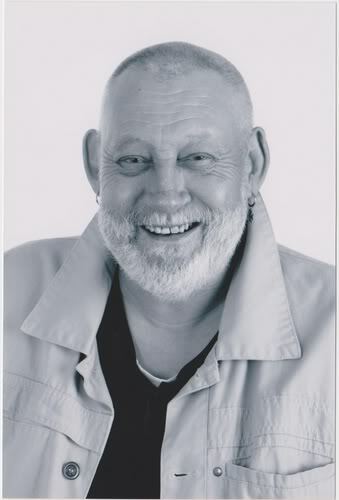 It concerns both a real and a phantom castle based upon Alan’s experience of strange castles on the wild Northumbrian coast of England on cold, dark wintry afternoon. Boris had a bad accident. Then things got worse. Bad-Off Boris and the Cupcake Cave-In takes place in a fantasy world where delicious sweets and classic monsters come together to tell a story about being different and dealing with change. Will Boris be able to turn his luck around or is he doomed to be bad off forever? I’m a 15-year radio vet who spent 8 of those doing mornings at pop station Z-93 (WGTZ-FM) and rock station 103.9 The X (WXEG-FM) in Dayton, Ohio. I’m currently writing while being a stay-at-home dad. My first novel is “Tales of a Washed-Up Never-was” and my new children’s book is called, “Bad-Off Boris and the Cupcake Cave-In.” I have a lovely wife and two wild children. During our free time we go to the drive-in as much as possible or watch classic monster films and cartoons on the family projector. You can find me on Facebook, Goodreads, as @MallorysWord on Twitter, or my website http://www.blackcloudbooks.com. Thanks for checking out the page! Little Nani is a little girl who likes helping people. However, when she helps people the results can be a bit unexpected. Why is that? Little Nani is a witch! Or at least she wants to be a witch. With her magic wand, she will try to cast different spells to help her friends, but she won’t be successful all the time. Follow Little Nani in her funny adventures and meet her extraordinary friends. Funny ostriches, horses that love reading, super-fast turtles, grumpy zombies… Little Nani has lots of friends! You can also draw your own characters! Little Nani is willing to become a good witch. Will she manage to do it? Who knows? Read the stories and discover what happens next! 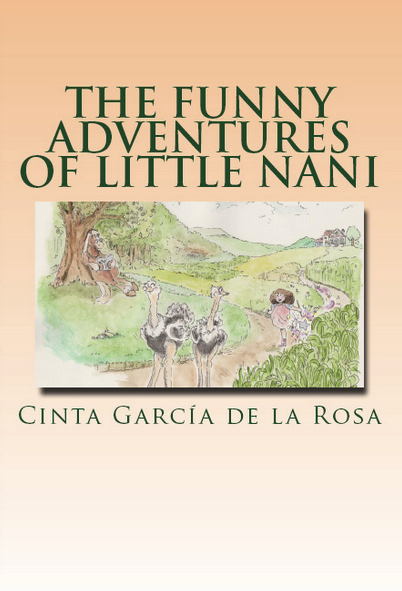 The Funny Adventures of Little Nani is the first in a series of children’s books. Right now I am writing the second book and I hope I can release it next Spring 2013. Cinta García de la Rosa is a Spanish teacher who always dreamt of being a writer. So she writes, every day, compulsively. Always active, she is also an avid reader, a blogger and a book reviewer. Her first writings were in Spanish, but, since she got her BA in English Studies, she decided to start writing in English. Now, she feels more comfortable writing in English than in her mother tongue. She has just published her first book “The Funny Adventures of Little Nani”, a collection of stories for children, with illustrations and other surprises. She is also working in other projects: a collection of short stories, the Groovy Cool Adventures Project, and a novelette based on the British Regency period. Apart from writing and reading, she enjoys meeting new people, dancing, and traveling. Always glad to chat with her readers, you can find her on FB.